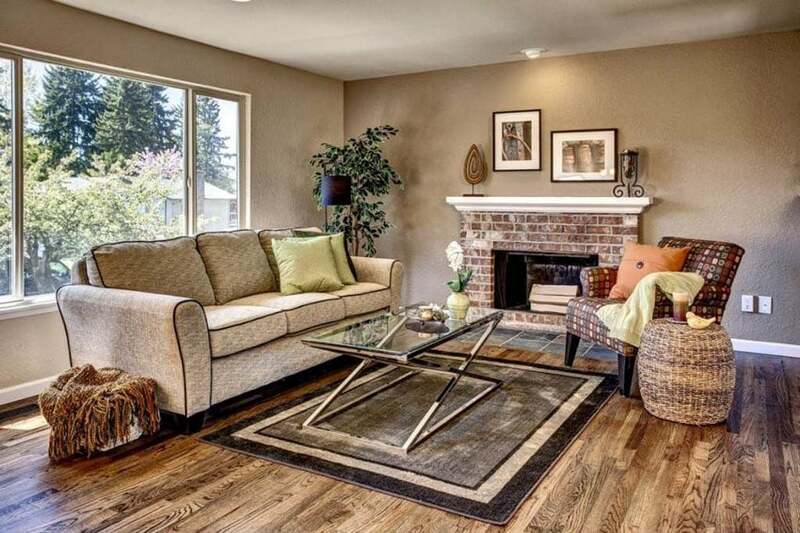 This gallery features beautiful living rooms with hardwood floors. 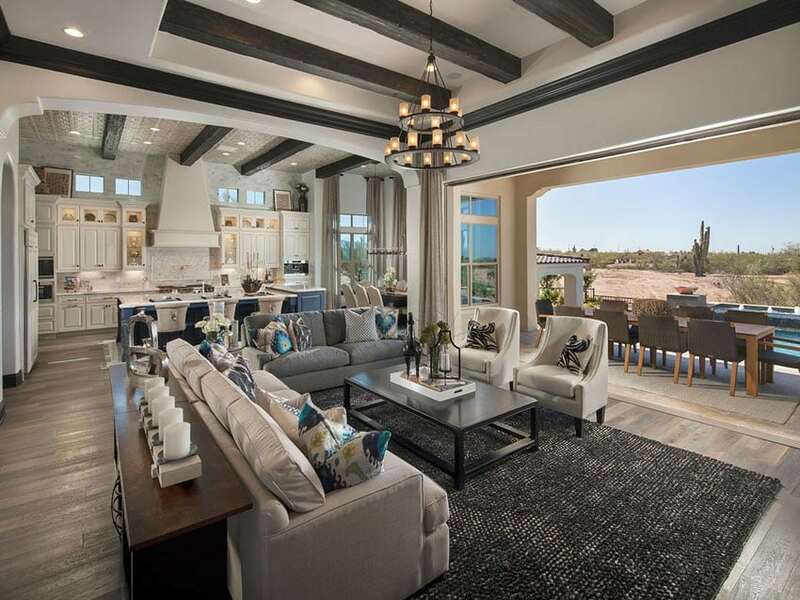 Living rooms shown include a variety of styles such as Mediterranean, rustic, craftsman, transitional, Spanish, Asian, modern, contemporary and traditional. Solid hardwood is gorgeous and durable. Since it is milled from a single piece of wood it can be repeatedly sanded and last for decades. Engineered hardwood offers an inner core of wood with an outer layer of hardwood veneer. With an engineered hardwood, one can get the same look and beauty without all of the cost. In addition engineered hardwood is more resistant to heat and moisture than solid hardwood flooring. In the picture above the rustic solid European oak wood floors gives this Mediterranean home a more relaxed country vibe. 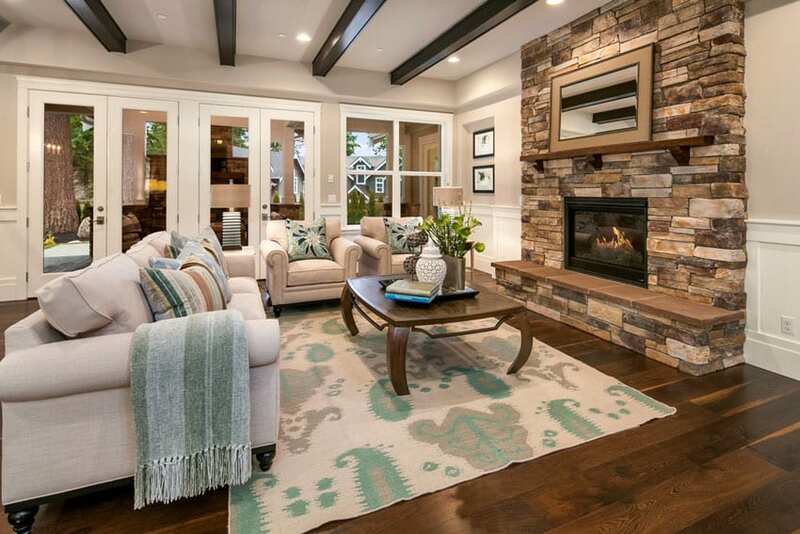 Paired with other neutral colors and a touch of turquoise as accent, this home definitely looks really relaxing. 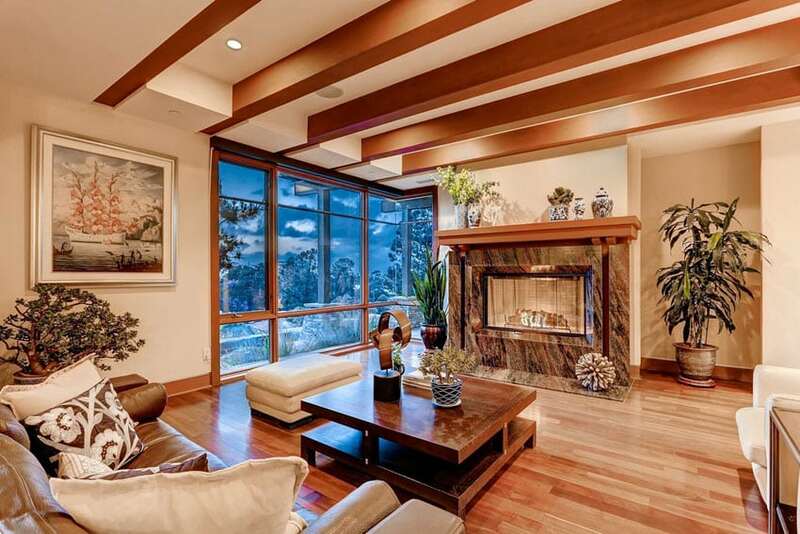 Walls are plain white, and ceiling have accent wooden beams in dark wengue finish. Furniture pieces are mostly upholstered in a light cream color, combined with dark wood stain and some touch of blues on the pillows. 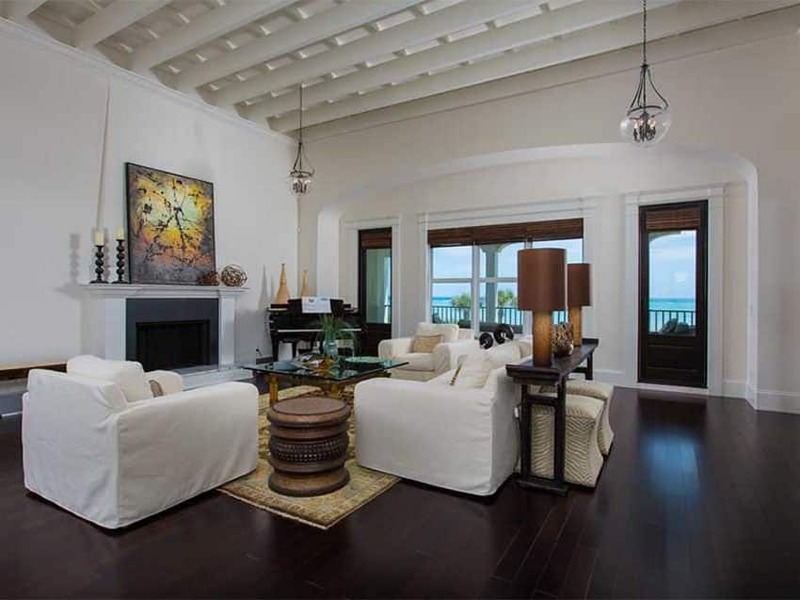 This living room has classic Spanish elements, combined with more modern finishes. 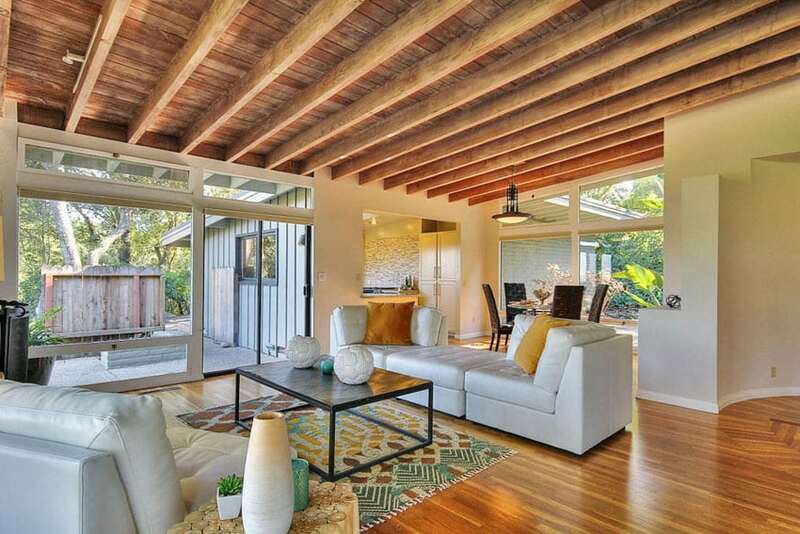 The floors have a soft golden tone, mostly due to the solid fruit wood flooring, and the light cream painted walls. Furniture pieces are slip-covered armchairs and sofas, paired turned wood details on exposed wooden legs seen on the coffee table. The ceiling also has exposed wooden beams and trusses in antiqued wengue finish, completing the rustic look of the space. A gorgeous modern contemporary space with solid teak wood floors and ceiling paired with plain white walls, creating a warm yet minimalist background for the furniture pieces. 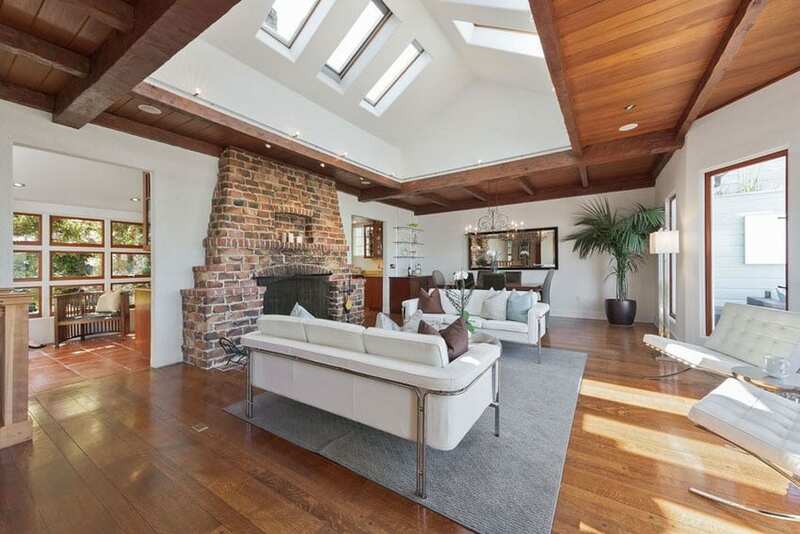 The space is already bright due to the many windows providing natural light into the space, but other than that, there are also 6 skylights right above the living area, provide more natural into the space. To keep with the modern look, the furniture pieces are all modern, upholstered in white leather and has stainless steel legs. Adding texture and dimension to the space is the large brick fireplace and the use of some indoor plants, making the over-all look of the space more relaxing and unique. A small lounging room with a raw, rustic feel to it. It uses unpolished planks of golden pecan wood all over the floors and up to the side paneling of the walls. The same wood was used to build the built-in bench, the window opening framing, the display shelves and even the fireplace area. This results in a cabin-like feel, but with a lighter feel to it due to the plain white walls. The furniture pieces matches the over-all look of the interior details – brown leather chesterfield sofa paired with 2 fauteuils. 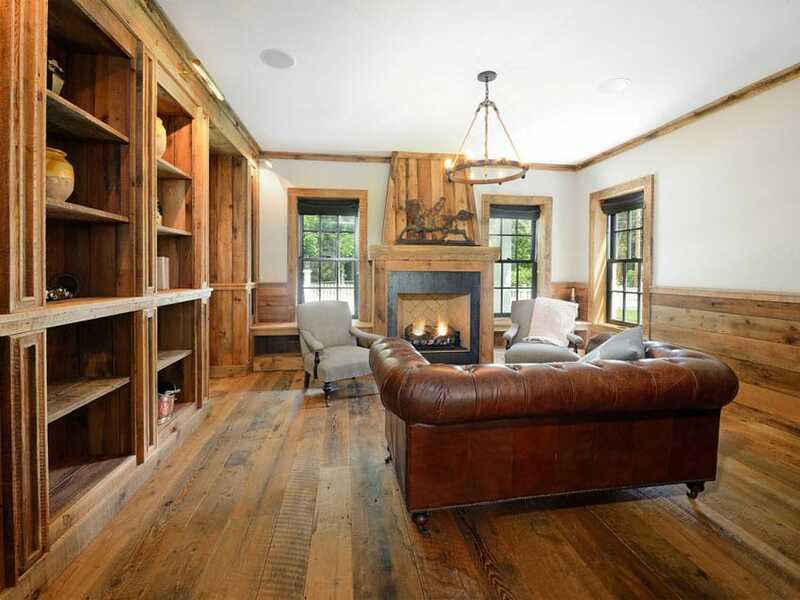 Puritan pine wood was used as the flooring for this gorgeous lounge area. The wooden floors were paired with sky blue painted walls and white moldings, creating a very refreshing feel to this small room. In the middle is a pair of armchair and ottoman, and a sofa, all upholstered in a bold red color. The red is bold pop of color, placed against the soft colors on the walls and the other built-in elements of the space. This living room gives a modern twist to classic Mediterranean-inspired space, using softer finishes and materials, and more simple silhouettes to achieve the look. The walls were painted in a soft brown color with white moldings, while the floors are perfectly polished pickled oak, creating a light background for the interiors. 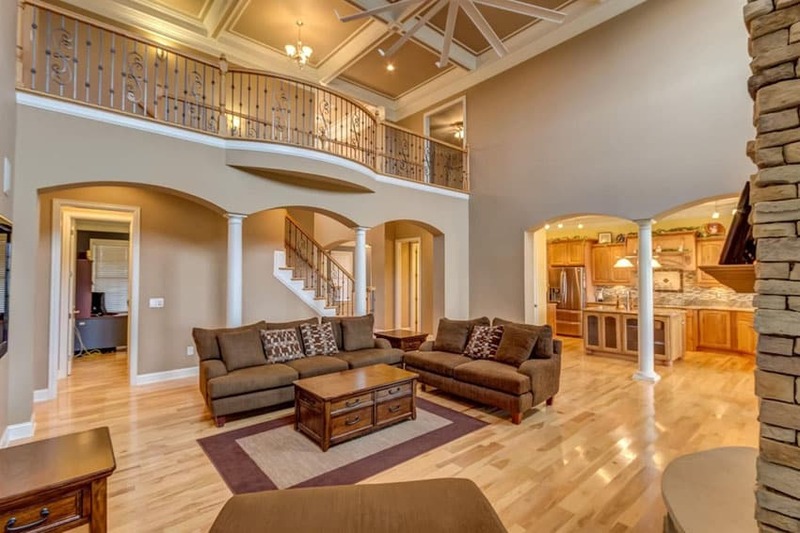 Due to the mezzanine floor, the ceiling of this living room is really high and has been fixed with a very large ceiling fan, which is a more modern and functional choice. Furniture pieces simply consists of 1 large sofa and a loveseat, a coffee table with storage and a side table. A soft and elegant transitional style living area which combines dark oak floors with light gray walls and white moldings. The living area uses 2 matching scroll-armed sofas upholstered in gray velvet fabric and two wingback armchairs with white printed fabric. The electric fireplace was clad with white wooden mantle with a matching display shelf and cabinet, creating a unified look. This is a modern living room with a high ceiling, as it has a mezzanine floor overlooking the living area. 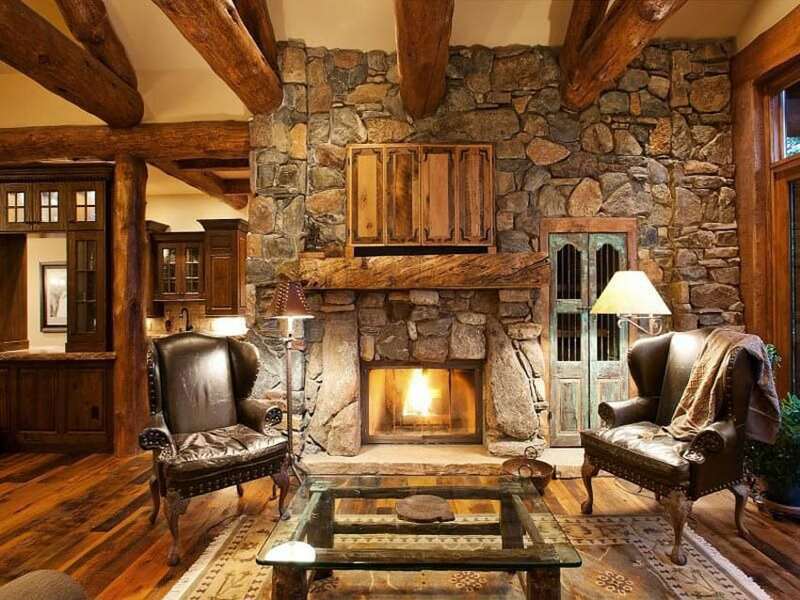 The floors on the ground floor are solid wide plank hickory in a matte finish, giving a rustic feel in contrast with the plain clean white walls and the stone cladding on the fireplace wall. For the furniture, a large sectional sofa upholstered in a dark gray fabric was used, and a pair of cantilevered armchairs upholstered in yellow faux leather. There are also two square coffee tables at the center of the set-up, and a console table for accent right at the back of the sofa. 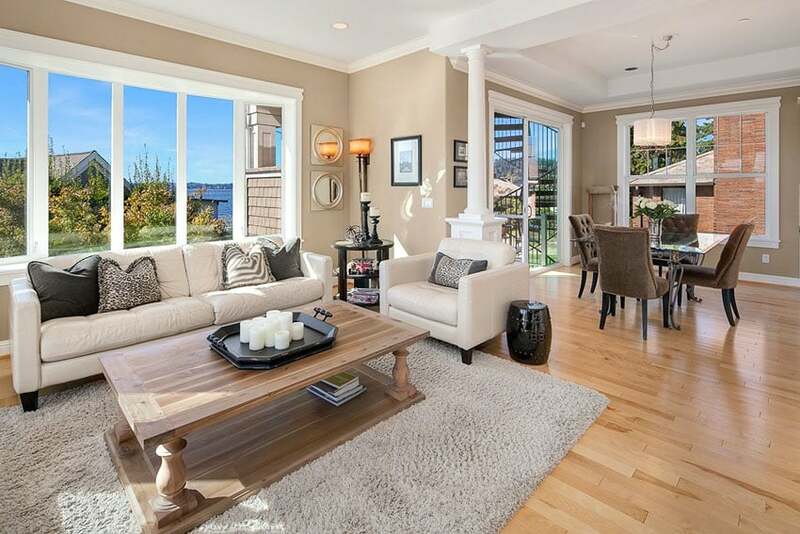 Large windows helps make this space look bright an inviting. Beech wood floors paired with light cream walls provide a light and bright background for the interiors. The furniture pieces comprises of both modern and classic-inspired pieces, like the modern white leather-upholstered sofa and armchair, the light oak classic solid wood coffee table with light beige high pile area rug underneath and the classic tufted back dining chairs in brown velvet fabric. A simple yet elegant modern living space, with dark red acacia floors paired with dove gray walls. It has an accent wall with black wallpaper and a central panel clad in cement finish tiles. The sofa used is a sectional l-shaped sofa with a matching square ottoman upholstered in a light gray fabric. The entire space is only sparsely furnished, giving an illusion of a bigger space. Dark maple floors set a really dark contrast against the plain white walls and the white painted wooden trusses on the ceiling. Furniture pieces all uses white slip covers, making it really pop out of the very dark floors. 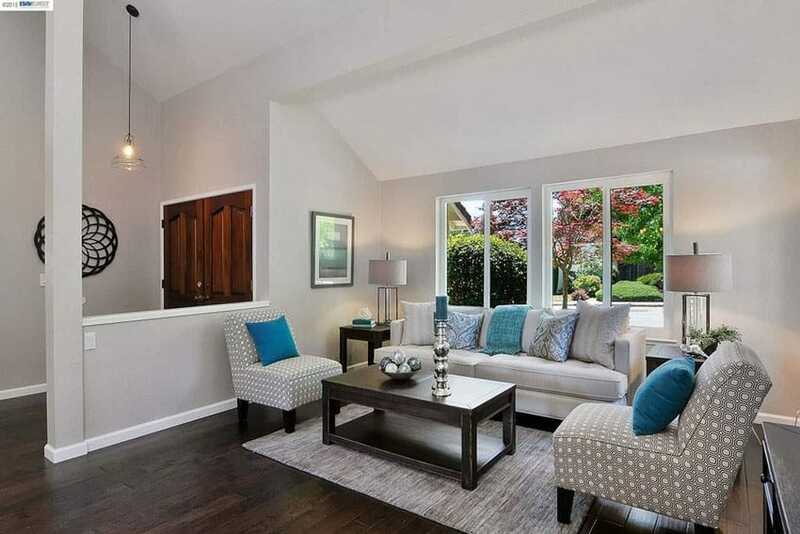 Framing the living area is a traditional area rug, adding a little texture and pattern into the space. There are also Asian-inspired pieces used in this design, like the metal stool and the wengue console table behind the sofa. A very simple modern contemporary living room, with a soft and elegant look. The flooring is pale teak wood paired with white walls, giving a soft, gray ambiance to the space. The living area is framed by a large area rug, while the furniture pieces is composed of a white sofa, two modern black accent chairs, an x-legged bench and a matching stainless steel & glass coffee table & side table. Despite the simplicity of the set-up, the color combination and the large picture windows create a really lovely look to this space. This is another contemporary living area which uses solid oak floors paired with oatmeal-painted walls. 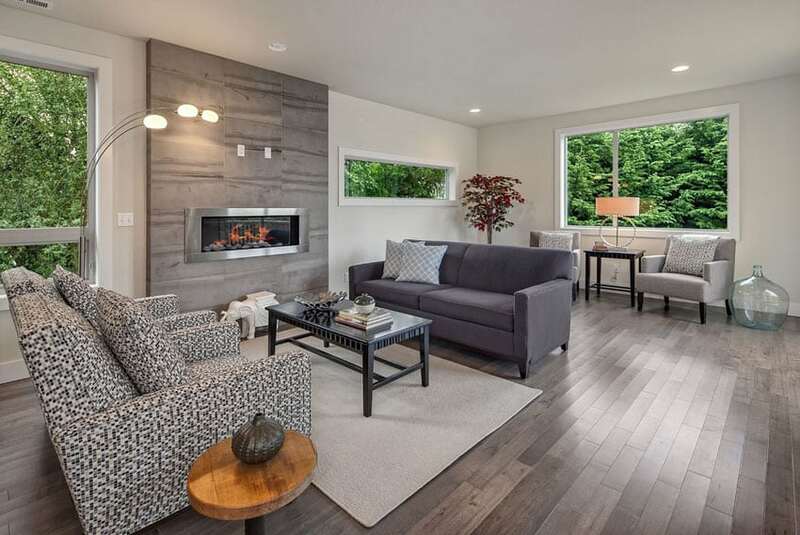 It has an accent wall with a built-in electric fire place, clad with gray soapstone tiles. For the furniture, it has a loveseat in purple, 2 armchairs with pixel pattern fabric, a small wengue coffee table, a small pedestal side table, and two side armchairs with a matching side table in between. The combination of different fabrics creates a more fun and dynamic look to the space. 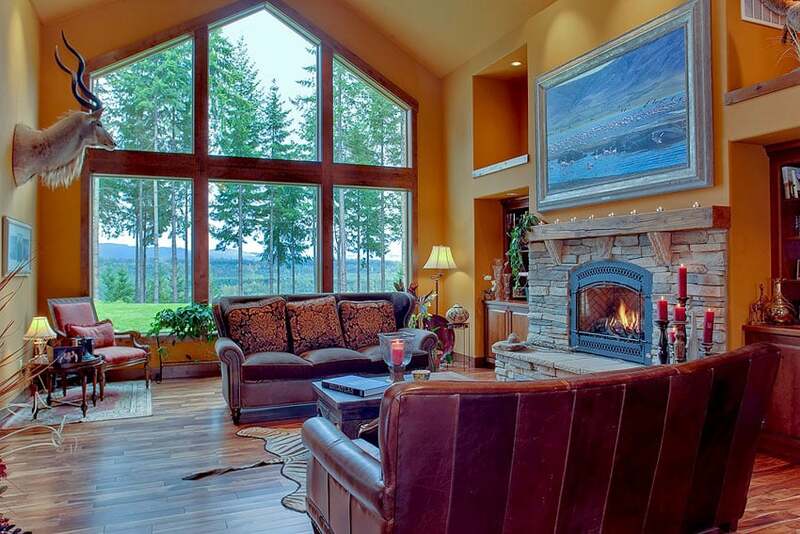 This craftsman style living room has weathered hardwood flooring that compliments the exposed log beam ceiling and rough stone fireplace. Two leather Victorian style chairs surround a glass table on top of an area rug. This living room has a relaxed, tropical rest-house vibe to it with ts combination of bright colors, reminiscent of a tropical summer. Solid Brazilian cherry wood were used for its floors, while the ceiling has exposed wooden beams and planks from driftwood. The walls were painted in a light oatmeal color, providing a soft, neutral background for the interiors, while the furniture used are of modern silhouette. Furniture pieces include sectional sofa in white leather upholstery, a metal coffee table, a side table made from driftwood pegs and a colorful flat weave area rug. Adding a pop of color to the space are the mustard throw pillows and some turquoise accessories. This living room combines the simplicity of modern design and the elegance of classic interiors. Polished light Brazilian Mahogany wood floors adorns the floors, while the faux wood beams are veneered with pine and given a nice light polish. Walls are painted in light cream, setting a warm yet modern background for the space. The furniture pieces consists of a leather-upholstered sofa, a white armchair and ottoman, a solid wood coffee table and side tables. There’s also a granite fireplace opposite the sofa, and many different indoor plants adorning the space, adding more dimension & beauty to the space. 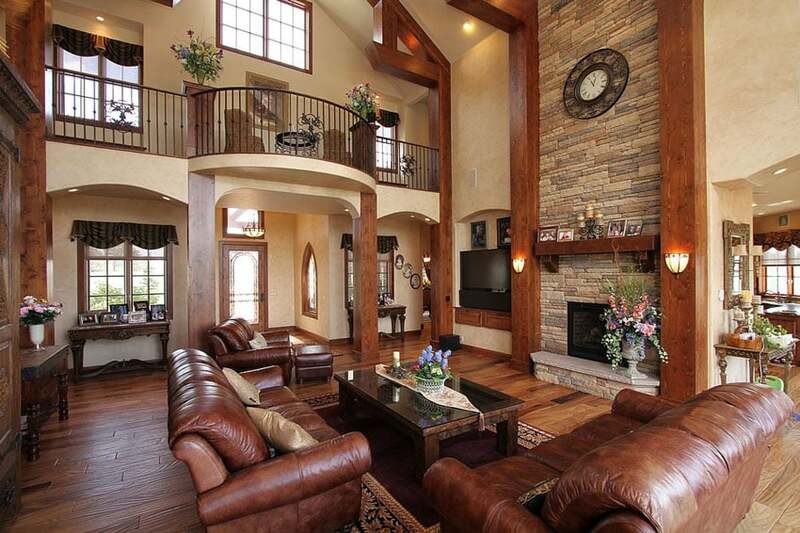 This classic style living room has a country feel to it, with its combination of materials and finishes. The use of warm colors give this a very cozy and relaxing vibe, while the materials used give off an elegant vibe without being too uptight. 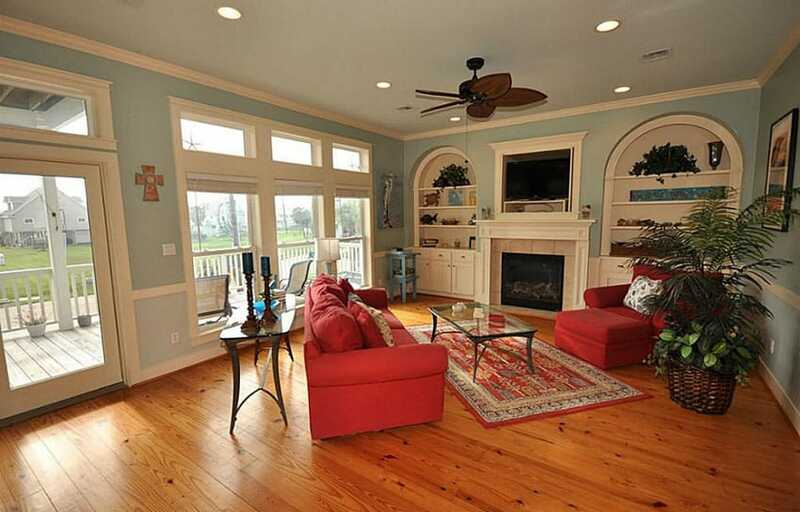 Floors are made of solid dark Hickory which matches the finish of the wooden columns and beams found across the room. This is combined with rag-rolled paint finish on walls in a light cream color, giving a light yet warm background to the space. Furniture pieces are all matching, with two sofas and one lounge chair with ottoman, all upholstered in brown leather. A transitional modern design which combines modern styling with classic furniture silhouettes. Vintage french sofa/daybed with white washed wood frame and gray fabric upholstery, combined with Vintage French wingback chairs were the furniture pieces of choice. This is combined with x-framed stainless steel coffee table with clear glass top for a more modern twist. The pale gray of the furniture and the area rug is balanced out by the bright orange tones of the solid distressed French Oak wood floors, creating a nice balance of warm and cool colors. 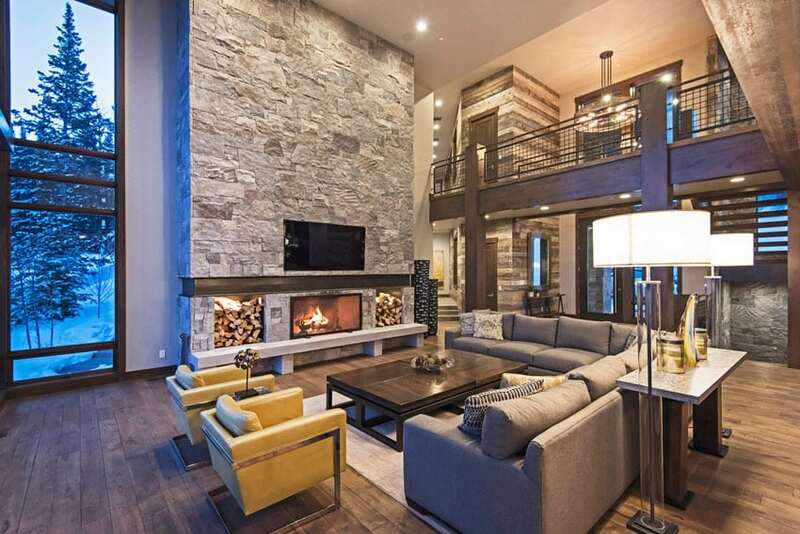 This living room is a mixture of different styles, but ultimately tries to achieve a luxurious and elegant look. Engineered oak wood floors were combined with off-white walls, decorated with wooden wall art, giving it a touch of Oriental design element. For the furniture, there are two brown leather sofas with an authentic vintage appeal because of its aged leather, and for the accent chair, a high back wood armchair with white tapestry fabric was used. 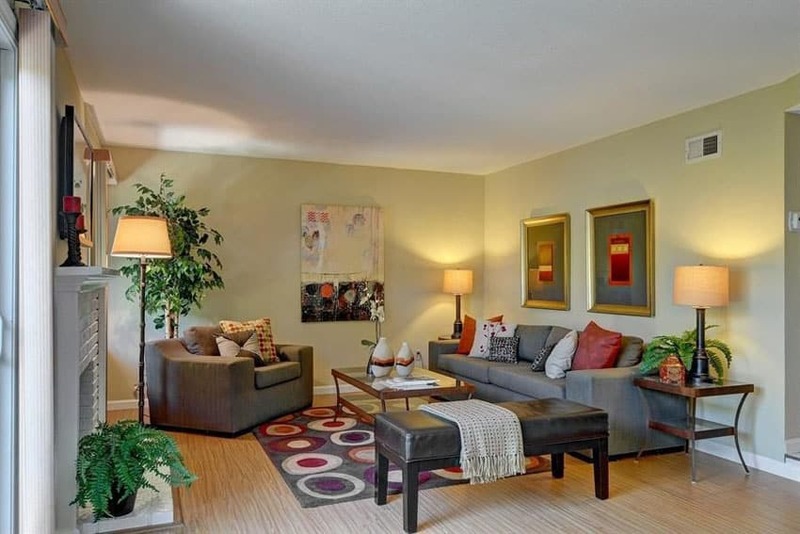 This small living room ha an eclectic mix of styles and furniture pieces. You will see modern pieces, along with classic vintage pieces, giving the space a very unique appeal. 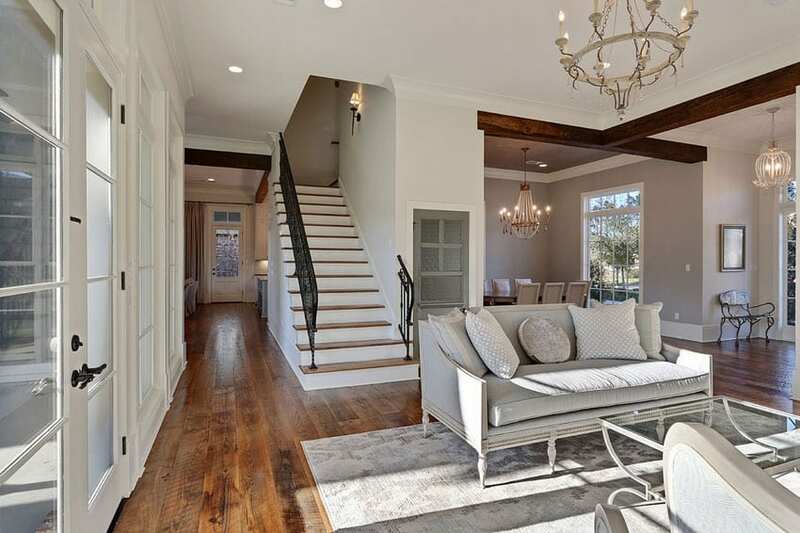 Floors are solid African Mahogany, combined with cool gray and off-white walls, pine wood doors & beams. The small living area has a fireplace and a plaster mantle in white, flanked with two pine display shelves/bookshelf on each side. For the furniture pieces, there are two vintage Bergeres painted in white and with white fabric upholstery, a modern ottoman with Moroccan Arabesque fabric pattern, a French square ottoman, lounge chair with wooden frame and fabric matching the ottoman and a neo-classic pedestal table. This is another fresh and relaxing living room look, using sea-foam green as the accent color. The seamfoam color gives the space a fresh and bright appeal without going overboard, keeping the rest of the elements of the room a timeless classic. As you can see, the rest of the room has a classic color combination and furniture pieces, using scroll arm sofas and armchairs upholstered in light cream. 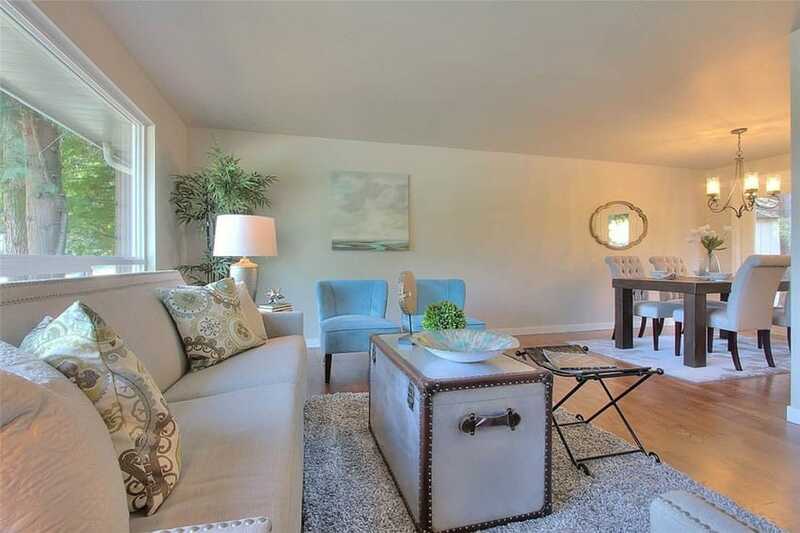 It has seamfoam colored accent pillows and area rug, adding a pop of color against the dark walnut wooden floors. This is a small living area with an open floor plan, which is why you can see the kitchen area in the background. It uses weathered honey oak wood floors, giving it a rustic feel, while the walls are simply painted white. There’s a corner fireplace area fixed with electric fireplace to save space, and a modern leather sofa for maximum comfort. 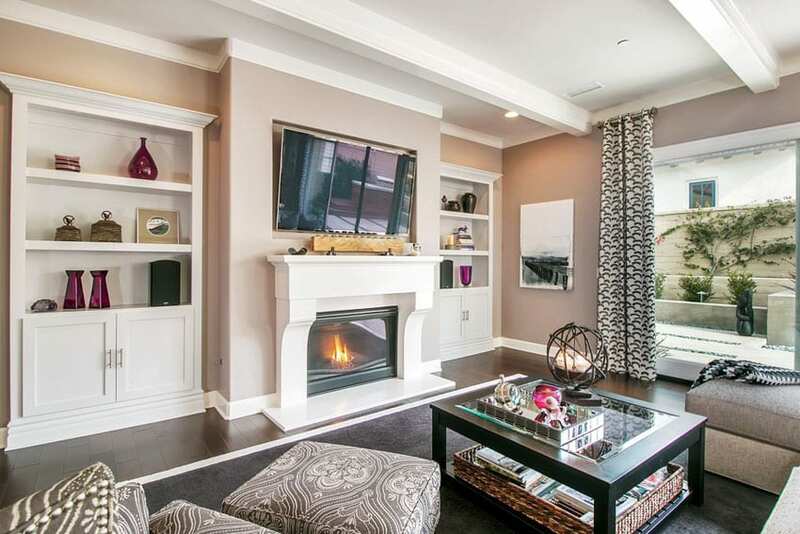 This living room design simplifies classic silhouettes and gives it a more modern look. 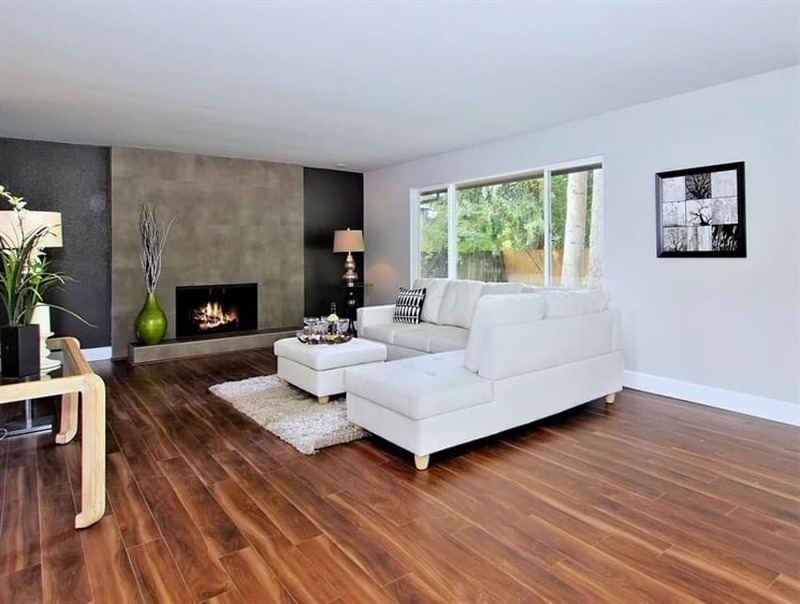 Floors used are dark maple, paired with light brown walls and white moldings. The cabinets are inspired by classic design, but given a more modern twist by painting it white and using less curves and carvings. The sofa used is a modern sectional sofa upholstered in gray linen, paired with an armchair and a matching ottoman with printed fabric. Another eclectic style living room, this has French interior architectural details such as French windows and doors, as well as mid-century modern furniture pieces. 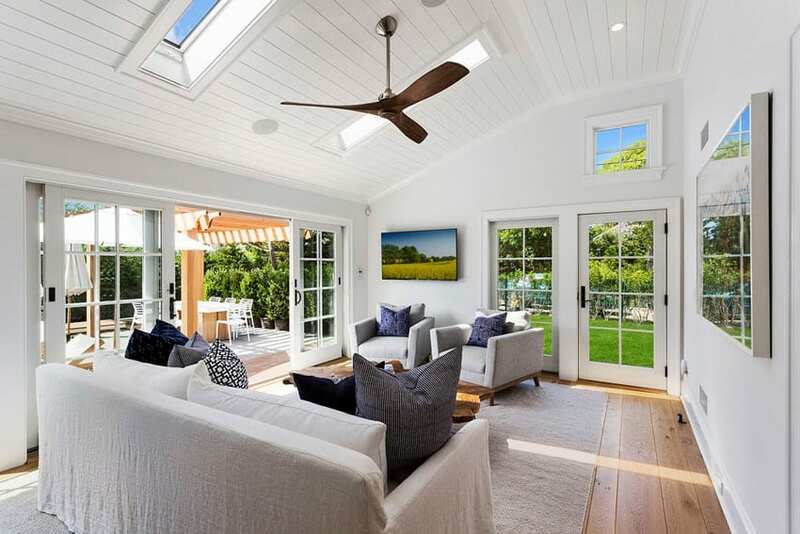 Walls and the sloped ceiling were all painted in white, giving clean and bright background, while the maple wood floors provides a warm color into the space. Furniture pieces are simply a slip-covered sofa in white linen, a pair of midcentury modern armchairs in light gray and a natural wood coffee table. To add a bit more dimension, blue and navy throw pillows were used as accents. Another classic-inspired living room space, this uses antiqued solid teak floors, which has a matte finish, making it look worn and aged, matching the wooden beams on the ceiling. 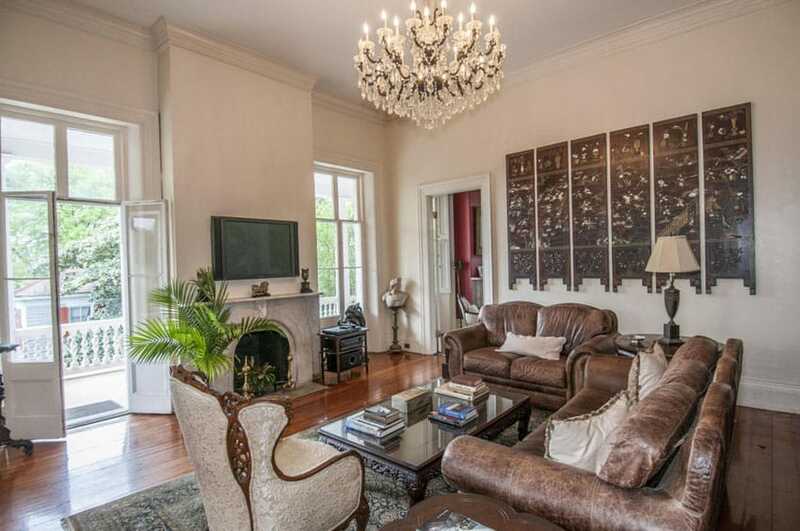 The walls were painted with a marbled technique for a more aged/weathered look, white the fireplace mantle has classic motifs and a rough old concrete finish. The furniture pieces is simply composed of a large sectional sofa in light cream, a console, a Spanish high back chair and a coffee table. This is another transitional style living room which combines classic furniture pieces, with more modern and rustic elements. Floors are weathered teak, giving it a rustic look, creating a contrast against the very formal look of the wall paneling. Furniture pieces include a slip-covered sofa, and two wingback armchairs with checkered seat upholstery. There’s no doubt that dark wood floors are beautiful and give your room a modern and elegant look. they also have several advantages over the more traditional looking light wood flooring. First, dark wood floors absorb less light making them less susceptible to fading from direct sunlight compared to lighter wood. Second, dark wood can offer a dramatic contrast when paired with furniture and color themes. Third, dark wood flooring can really allow you to see the grain of the wood which offers stunning beauty and a feeling of luxury. On the downside, dark wood floors show scratches a little more readily than light wood. In addition, dirt and pet hair tends to stand out more on a dark surface. Going for a dark and mysterious appeal, this living room keeps its lighting warm and dim, creating a cozy atmosphere. The floors are of elegant American walnut, which definitely matches well with the heavy baroque style furniture pieces and architectural details found around the house. There’s a pool table on one side with a traditional carpet underneath, and a living area right across it. Opposite the brown upholstered sofa is a fireplace with females busts as mantle, and flaked with two wooden cabinets. The combination of warm colors, heavily carved wood and dim lighting, definitely gives it a cozy and mysterious feel to it, making it look very vintage. Rustic fruitwood floors and plaster finish beige walls set a sort of rough and earthy feel to this simple living room set-up. It goes for a warm brown color scheme, with a few accents of yellows and oranges. Sofa is a simple beige sofa with dark brown piping accent, while the armchair uses printed fabric in dark red. Yellow and orange throw pillows adds a pop of color to the space without making it stand out too much from the neutral colors scheme, while the woven side table and the area rug adds a touch of more texture to the space. A very simple modern living room set-up which uses a gray and turquoise color scheme. It uses dark Brown Oak wooden floors paired with light gray walls, giving it a nice contrast. The furniture pieces on the other hand, is a combination of modern pieces and all-wood classic pieces. There’s a sofa upholstered in light gray fabric, two accent chairs with gray printed fabric and a variety of pillows in turquoise and gray. The exposed wooden legs are finished in wengue, as well as the side tables and the matching coffee table, creating a harmonious design. 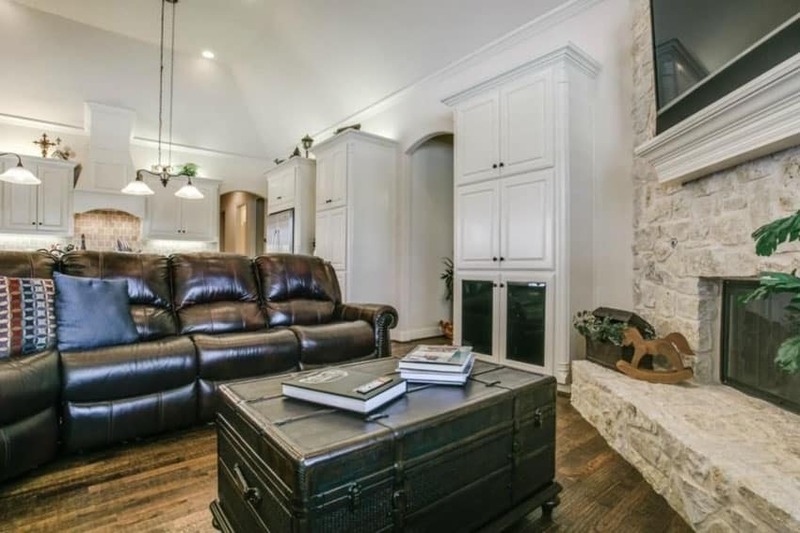 Another transitional style living room which uses more rustic finishes to achieve this look. 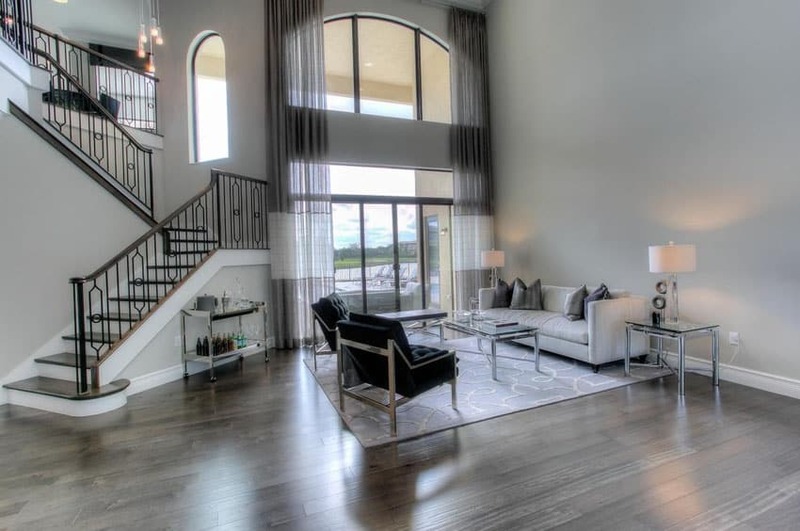 It has dark maple wood floors combined with soft gray walls to give a nice neutral background. 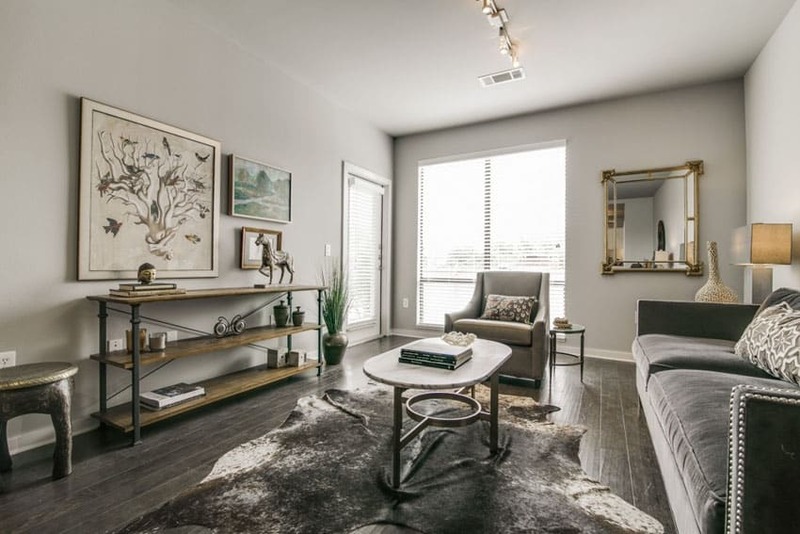 The sofa has a modern silhouette, upholstered in dark gray suede with nailhead accents, while the accent chair has a high sloped back upholstered in light beige. In the middle is a faux cowskin area rug, with an elliptical marble-top coffee table in the middle, and a console table opposite the sofa. 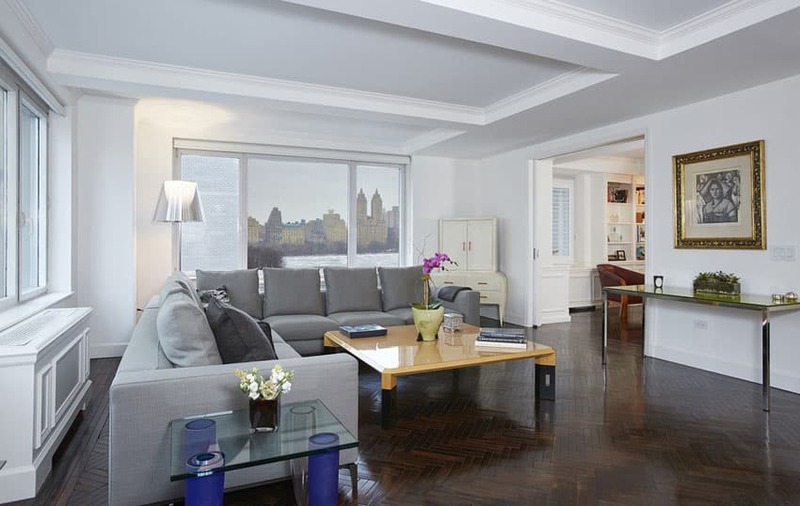 Despite the modern look of the space, this living room keeps it gorgeous solid mahogany herringbone parquet floors, preserving a classic floor finish. 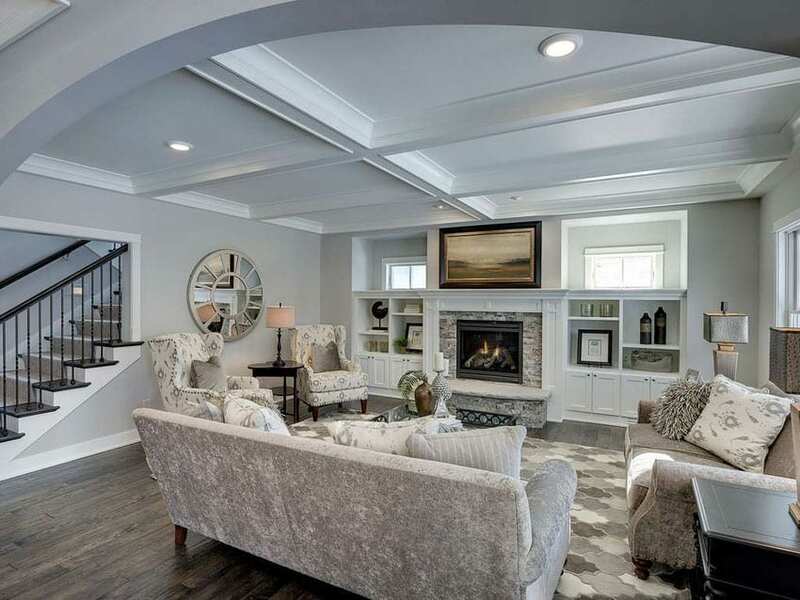 The rest of the space is styled in a more modern look, painting white all over the walls and ceiling, creating a clean, light background for the large modern sectional sofa in gray. The neutral colors also help tone down the bright yellow of the large coffee table in the middle, creating a relaxed look, suitable for all seasons. This small living room has various retro/vintage modern pieces, making it a really interesting space. Mahogany floors were paired with white moldings and gray walls, setting a dark, yet neutral background. 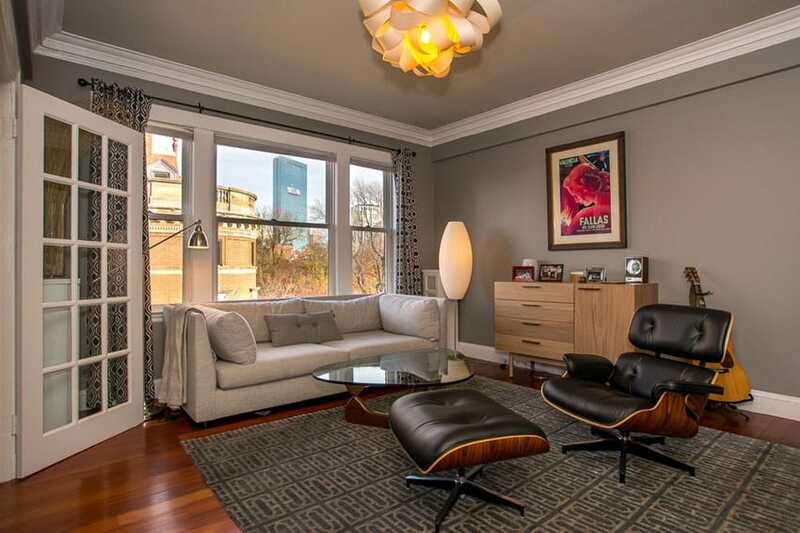 The gray walls look perfect with the light gray modern sofa and the the classic Eames lounge chair in black. There’s a mid-centry modern sideboard with a nice matte finish on the side, a geometric area rug in charcoal and beige and a pop of color from the framed poster. Adding a punch of color to this Vintage living room gives it a more cheerful and refreshing vibe. Light Tigerwood floors were re-polished to perfection, while the walls were repainted to a bright orange, giving the space a nice update. The rest of the pieces of this living are all vintage, like the pair of leather sofas, the French armchair on the side, the tables, accessories and even the fireplace. Additional lighting also helped give this space a more modern look, making it more pleasing to the eye and easier to live in. Light hardwood floors look amazing especially when staged with dark furniture and can give you space a traditional feel. Light color wood also has a couple distinct advantages over dark wood floors. First, light wood floors tends to show less dirt, and second it is less likely to show scratches than its dark wood counterpart. Another advantage of light wood flooring is it can brighten up a room without a lot of natural light. A modern contemporary living space with a very clean and bright look. Pale white oak wide plank wood floors were paired with light gray walls, while the furniture goes for a more unified look, using the same fabric for the upholstery. The furniture pieces were two sofas, two armchairs with wood armrests, an upholstered bench and a large wood stump coffee table with glass top. The same off-white was used on all upholstered pieces, creating a very uniform look to the living area. This is a contemporary living room with a simple yet relaxing setup. It has a matching armchair and sofa upholstered in light cream, and two modern accent side chairs in black leather. The floors are pickled oak wood, which is a great match with the off-white walls, and helps give a brighter pop of color into this modern space. The most unique part of this living room would be how it integrates the wall art, into the walls. 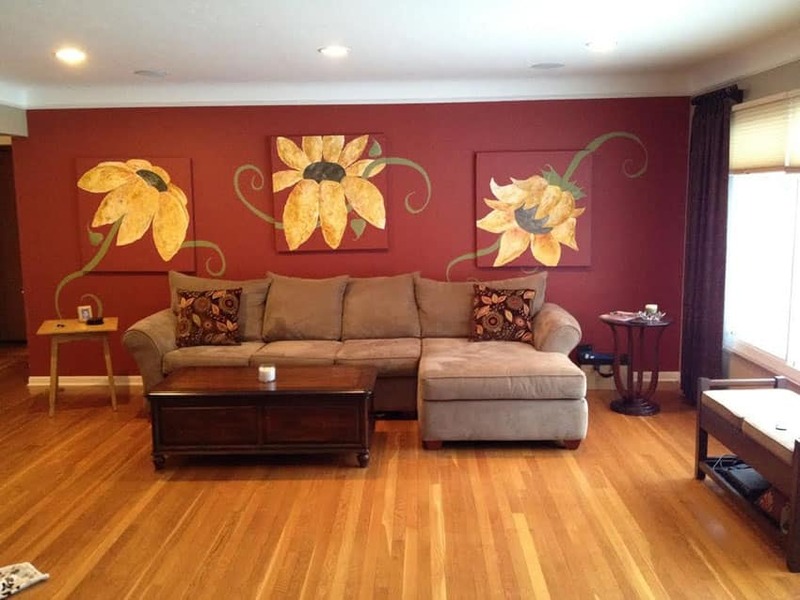 It literally connects the 3-pieces sunflower artwork into the wall, by matching the wall color with the paintings’ red background, and connecting the vines/stems of the flowers, extending it beyond the canvas and into the wall. Golden pecan floors complement the yellows of the artwork well, while the simple l-shape sofa in brown suede helps keep a neutral ground in the area. 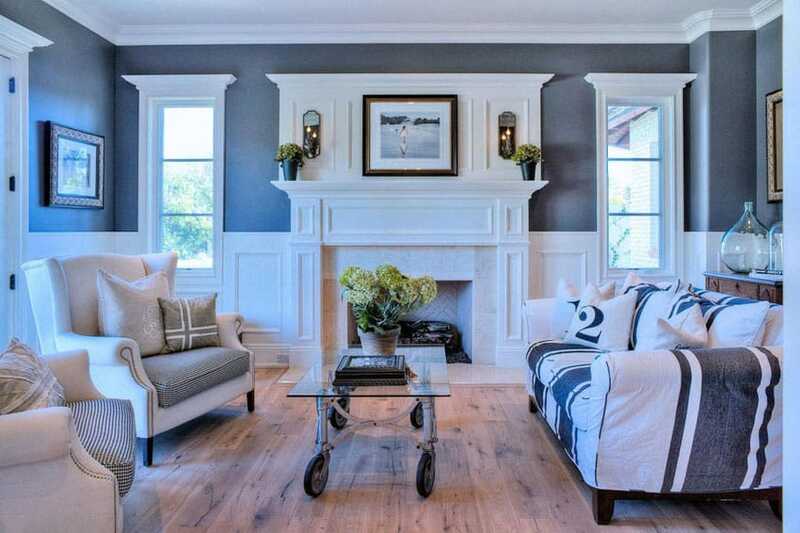 This is a simple living room with light beech wood floors and mint gray walls. The furniture pieces are modern and simple – a matching pair of sofa and armchair upholstered in charcoal fabric, with red and white accent pillows. There is also a bench with upholstered seat in black leather, and a matching pair of side table and coffee table made from bronzed metal framing and glass top. 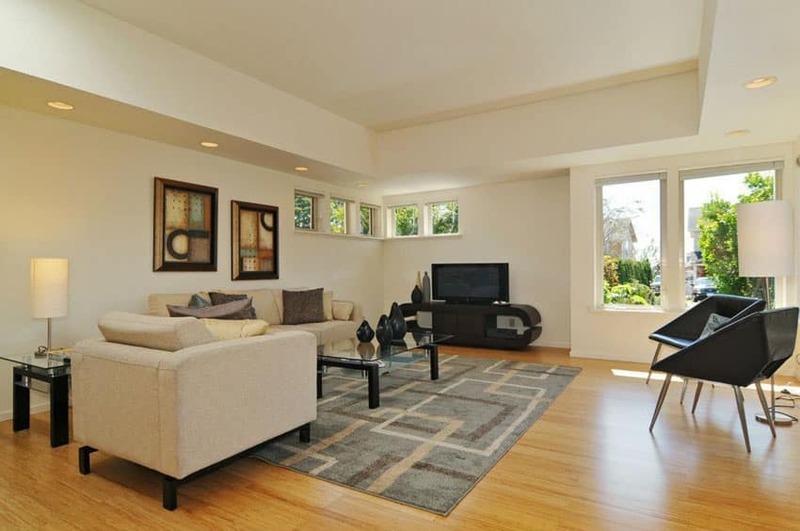 A transitional living space adapting an open layout for a lighter and more spacier feel. With bright off-white walls and maple wood floors, the whole space looks bright and inviting, setting a good background for the living room furniture. The sofa was upholstered in off-white linen, with two sky blue tub chairs for accent and an interesting chest was used as the coffee table. Adding more texture is a shaggy rug and colorful pillows for accent, as well as some indoor plants to give the space more color. This wonderful Asian contemporary inspired space is a perfect relaxing get-away from the busy city. 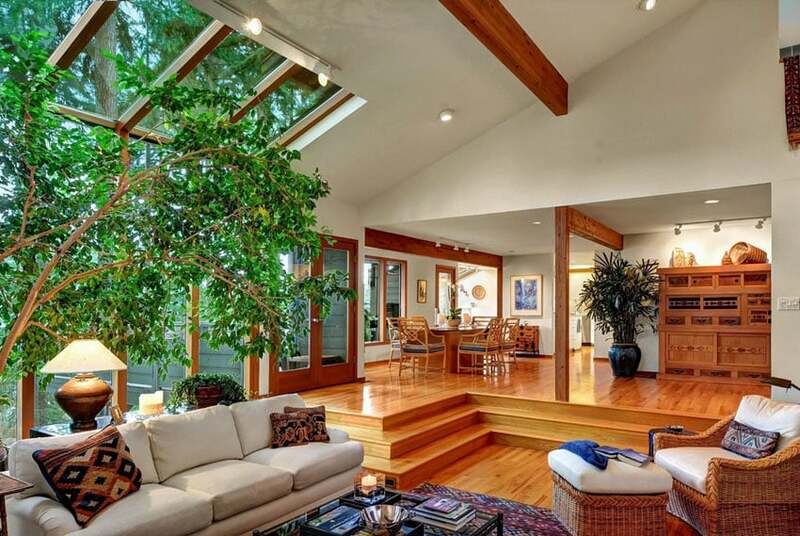 With large glass windows which opens to a nice outdoor view, and even indoor trees, this space will always take you to vacation, giving you a bright environment with clean fresh air. Floors are solid colonial maple wood paired with plain white walls and ceiling, giving way to various prints and patterns used throughout the space. For the furniture pieces, they went a little eclectic and adventurous, combining different styles and finishes. There are bent rattan armchairs for the dining area, solid teak storage cabinet by the hallway, woven rattan armchair and ottoman as accent table, and a classic sofa in off-white fabric upholstery. Among these are batik-inspired throw pillows,a colorful native-American inspired area rug and even Thai embroidered pillows. The result is rather fantastic, despite the variety, as it uses basic light colors, making the variety of patterns blend in with the rest of the interiors.